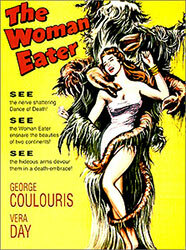 Doctor Moran (George Couloris) leads an expedition deep into the Amazon jungle. There he comes upon a strange ritual being performed. Natives dance and drum, sending an entranced woman into the clutches of large grasping plant. Five years later and Doctor Moran, now has the plant and one of the natives his basement. It seems that the plant excretes a liquid that can bring back the dead. Moran hopes to unlock its secrets, but to do that he’s going to need to feed his plant. As women in the area disappear, Dr. Moran’s mechanic, Jack Vennner (Peter Wayn) suspects that something is up, but if he gets too close to truth he could end up dead as well.